The fourth industrial revolution is shaking up the way we work. The end is not in sight quite yet, but leaders need to be awake. Video conferences, Slack chats, emails from Ameri­can team members last thing at night – especially knowledge workers now find their lives permeated with new ways of working. According to Professor of International Business at Aal­to University Kristiina Mäkelä, the shift stems from a fourth in­dustrial revolution. “The fourth revolution comes after factories, electricity, and computers. It’s a combination of different changes brought on by digitalization and globalization, and it’s only just begun”, says Mäkelä. 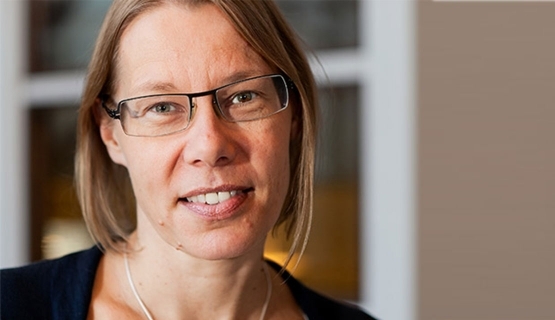 She has been analyzing changes in work together with her research group that includes Johannes Gartner, Jennie Sume­lius, and Hertta Vuorenmaa. The fourth revolution comes after factories, electricity, and computers." According to the group, work will be changing so much that three key interdependencies loosen: those between work and time; work and place; and work and employment relationships. These changes challenge the en­tire traditional corporate organ­izational model, HR field, and leadership styles. Mäkelä admits that there are no ready answers. Changes are still underway, and each organi­zation unique. Everyone needs to find their own solutions, with their own strategy, capabilities, and practices as starting points. The relationship between work and time is influenced by globalization and a faster pace in general. Digitalization has resulted in things taking place in real time and people communicating across time zones, a 9 to 5 working day tak­ing a backseat. “The line between work and leisure time becomes blurred thanks to people’s individual needs and the spread of mobile technology. Instead of a tradi­tional balance between work and personal life, this can lead to work and personal life becoming integrated,” says Mäkelä. Place-independent work is increasingly com­mon." According to Mäkelä, work and place becoming less interdependent doesn’t mean the odd day working remotely, but a much more fundamental phenomenon. As an example, she mentions her daughter’s boyfriend, a Swedish coder studying at a Swedish university, working for a Canadian com­pany and living in Scotland, where her daughter is studying. Small, knowledge-intensive businesses like Yousician and Hellon have been springing up also in Finland, offering employ­ees a chance to uproot for warmer climes when the weath­er turns cold. Employees can decide to relocate together, or choose a period that suits them individually. Less interdependencies be­tween work and employ­ment relationships mean work transitioning from hierarchies to networks and different plat­forms. At the same time, career paths become increasingly indi­vidual. “The aim is no longer to go up the ladder. A need and op­portunities for meaningful work increase, resulting in more free­lancers and new technology-based operating models. Em­ployment relationships will be increasingly established on contractual relations. I believe this trend will be expanding to new professions and fields that are not yet affected,” describes Mäkelä. AaltoJOKO® is the leading management training program in Finland, combining scientific knowledge with solid practicality. In the philosophy underpinning the AaltoJOKO® program, the success of companies and communities is based on strategic knowledge and networks, as well as skilled and inspiring managers. Read more about the program. The Executive HR program focuses on enhancing your strategic HR leadership skills and competencies in a rapidly changing and evolving environment. It is tailored to HR leaders, business partners, learning and development specialists and general managers, as well as other professionals working closely with senior and mid-management teams across all sectors in Finland and abroad. Read more about the program.